- there were 11 submissions which went to voting and you can see all repositories on OpenCode4Connections' GitHub. 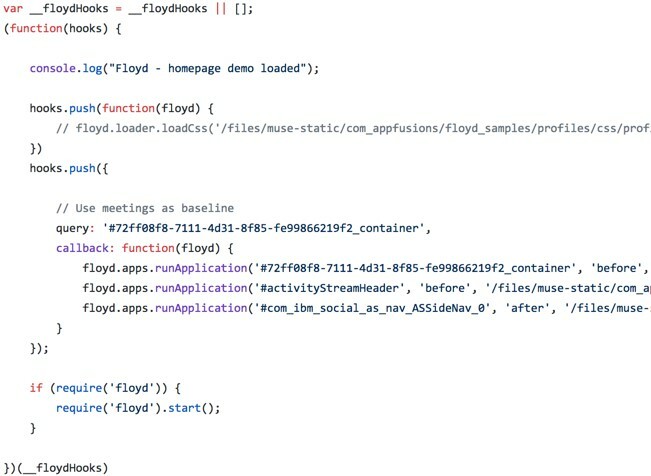 This project contributed a notifier and infinite scroll to the Activity Stream in Connections and was something Jay had previously built as custom code in the header.jsp of the homepage of Connections and extended into the Connections Customizer. As the ReadMe says, by taking the code you can also add this functionality to a Connections 5+ instance. Jay is also a first-time contributor to OpenNTF, so it's great to be expanding our contributor-base. This project is a very unobtrusive contribution which analyzes the tone of the status update, allowing the user to review before posting. The status is analyzed in intervals of 2 seconds while the update is typed. In the screenshot below it's been highlighted because, as I'm sure you can tell, it blends well with the rest of the content around it. The first project adds a weather widget to the community overview page of a chosen community, based on the community's UUID entered in the JSON. If you want it to apply to all communities, the "match" property of the json can be removed. 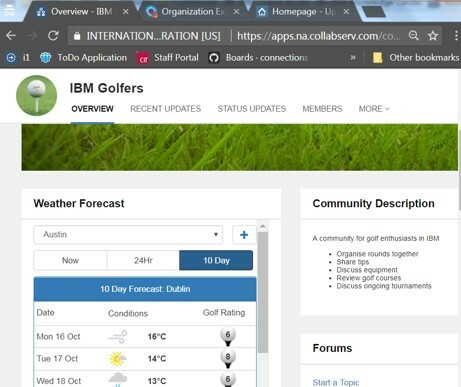 This points to an XPages application running on Bluemix and the Weather Company data from Bluemix and is a great example of integrating all these technologies into Connections. The second project again can be contributed to a specific community using the UUID or to all communities, by removing the "match" property. This allows posting to a Watson Workspace defined in a watsonSpaceId property. You'll also need to set up a Watson Workspace App, adding the appId and appSecret to the JS file. A special award was given to Daniele Vistalli who contributed not a customization per se but a framework for running applications or webpages, loading CSS etc. This allows you to add customizations more easily. Some time ago OpenNTF investigated the use of Open Badges to reward those who get involved with us. It's something we first became aware of when IBM issued them to IBM Champions, but for various reasons we've not been in a position to progress it. 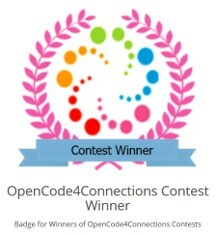 However, this contest gave us the opportunity to issue the first Open Badge, to our winners. You'll notice the badge features a laurel wreath (in pink, the colour associated with the current developments around IBM Connections) around the new OpenCode4Connections logo. Thank you to our contest winners for their patience with our faltering steps on this new journey! We'll be rolling Open Badges out wider during the coming months for various initiatives and you will see how we will vary the badges for our different brands.